There were a few houses in a beautiful and magnificent village. Those houses were pretty good looking. There was a cute dog and a cat in that place. 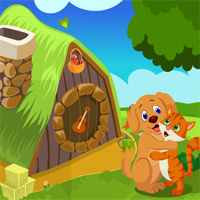 One day the cute dog and the cat were stuck in a house in the unexpected manner. It is your duty to save the cute dog and the cat from there.